Reversing Achilles Tendonitis is the right strategy to dealing with your Achilles pain and problem. Do you have Achilles Tendonitis or Tendonosis? Have you already tried to fix it? Whether you are a runner and an athlete, or spend all your time at a desk, or fall somewhere in the middle, the mechanism of pain is the same. Achilles Tendonitis is a progressive dynamic of increasing muscle tightness, connective tissue constriction, and pain and inflammation. You had a problem long before you felt any pain. And there's probably some Tendonosis in there too (degradation of the tendon due to cell death from lack of circulation to the tissue). Are you ready to make your Achilles Tendonitis pain levels drop? Get Rid Of Achilles Tendonitis? Probably by now you've tried other methods. You've taken time off and rested your legs. You've avoided activity. You've tried ice packs. You've tried anti-inflammatory medicines. You've done the stretching and strengthening. Maybe you've had corticosteroid injections, maybe spend some time in the boot. Maybe you've even had achilles tendonitis surgery. But you still hurt, and the pain and problem just isn't going away, and you're worried about causing even more damage to yourself. Why Didn't Any Of That Work? Tendonitis is made up of several factors. If you don't successfully deal with them each and all, then you fail to adequately affect with the SOURCE of the problem. The above strategies only target a single factor (and generally don't even do that very well). In general, the medical profession only goes after SYMPTOMS, not the CAUSE of your problem. That's just not going to work with Achilles Tendonitis. As I said, Achilles Tendonitis is a progressive dynamic. Multiple factors are involved. If you want to get rid of Achilles Tendonitis, you need to REVERSE the process that has been getting worse and worse. Reversing Achilles Tendonitis covers all the necessary bases and helps your body get back to a pre-injury state. If you aren't motivated to spend a little time and effort to get your Achilles structures better, you should stick with pain killers and sitting on the couch. Are you ready to get out of pain and get back on your feet? I just wanted to say thank you for the work you are doing. 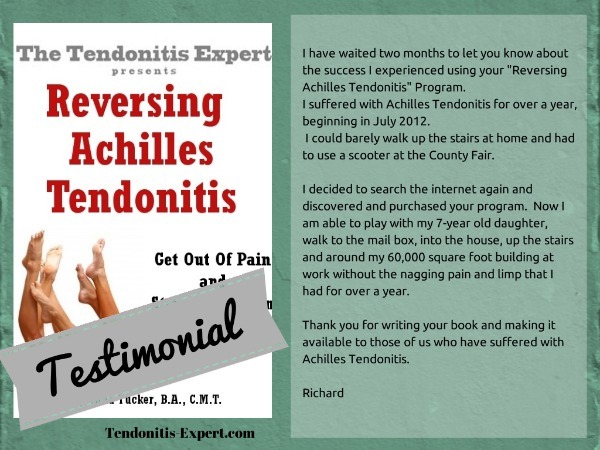 I bought your ebook on Reversing Achilles Tendonitis and experienced pain relief for the first time in almost 4 months. Incredibly, I got relief from your therapy after the first day and have been improving steadily every day thereafter. You had a comprehensive and workable plan that made perfect sense. And best of all, I saw results almost immediately. After months of pain and expensive treatments, I had almost lost hope of ever walking normally again. Now I am contemplating running again. Wouldn’t that be sweet? Achilles Tendon Surgery focuses on the Tendon. But guess what? In most cases, the tendon isn't actually the problem. Tendons certainly are NOT the -cause- of the problem. Tendon problems are just SYMPTOMS of something else. Something caused that tendon pain. Doctors focus on the tendon. But it's a waste of time since the tendon isn't what's causing your pain. YOU are going to focus on the actual CAUSE of your pain! We both know that that's the only plan that's going to work. Whether you are an athlete or a couch potato, the Achilles Tendonitis dynamic is the same. And the self-care treatment is the same too. If you do it enough to beat the pain causing dynamic and any injury that exists, then you will be helping your body restructure your lower leg back to a pre-injury state. Reversing Achilles Tendonitis isn't just about making pain go away. It will help the symptoms, but really it goes after the cause of your pain. You want to deal with the SOURCE of the problem! So first we'll drop pain levels, and then we'll continue to work to restructure your lower leg back to a healthy, pre-injury state. Again, this will take some time and effort as you help your body heal. Depending on exactly what you have going on, this can go fast or slow. It just all depends, but you know what will happen if you don't do anything that is actually beneficial for your Achilles, right? The more effort you put into it, the faster you'll get the results you're looking for. Are you ready to help your body heal? Who Is 'Reversing Achilles Tendonitis' For? This How-To-Guide is for anybody with Achilles Tendonitis and Achilles Tendonosis. It's also going to help people that have had Achilles surgery recover better and faster. Did You Take Levaquin Or Cipro? If you are suffering from Levaquin Tendonitis or Cipro Tendonitis and have Achilles Tendonitis symptoms, this program -may- help lower pain levels, but is NOT a fix for that kind of cytotoxic damage. You need The Fluoroquinolone Toxicity Solution. Remember I said the dynamic is the same for everyone. The treatment is the same too. Runners especially will like this program. Non-athletes will drop their pain levels and move on. But runners are going to keep on running, continue to put strain on their lower leg structures. Runners can use what's on this ebook to not only lower their pain levels, but to keep them selves running as much as they want for as long as they want. First, drop pain levels. Then, help the tendon heal. All the while, creating a more healthy, more capable ecology in the lower leg and feet. *hint hint* You can also use what you learn on here to help sore/painful feet. There a lot of reasons that would have you want to get the 'Reversing Achilles Tendonitis' program, but here are the four big ones. Reason #1. You have been looking for something that will deal with the SOURCE of the problem, not just the symptoms. To correct a tendonitis issue, you need to REVERSE the structural mechanics that are causing your pain and dysfunction. It's amazing what you can do with the RIGHT tool. Reason #2. Learn the SECRET source of Achilles Tendonitis pain and problem. IT'S NOT ACTUALLY THE TENDON ITSELF! Tendon pain and problem is CAUSED by something. Don't you think that it would be smart to fix the CAUSE of your pain and problem? Reason #3. The program is usually $39.97 but right now is only $29.97. You can't beat that price. You've probably already spent a lot more than that, or at least, you will if you go the normal route of trips to doctors, etc. Think of all the money you'll save if you follow the Achilles Tendonitis Protocol! There's also a 12 month, no questions asked money back guarantee, so there's no risk. Reason #4. At 63 pages, you can get what you need from this ebook program quickly, so you can get to doing what's necessary to start lowering your pain levels and reversing the pain causing dynamic right away. No fluff, no filler. No information that you don't actually need. There are products out there that have 6 DVD's, a thick workbook, audio files, etc. Personally, when I have a problem I just want the solution. I can learn more about it once the problem's solved. Reason #5. You want to be on your feet without pain. You want to run. And you want to avoid more pain and more injury. And you need to know how to keep this pain from coming back. It's a skill. How valuable would it be for you to have the skill to keep your Achilles structures healthy and pain free, no matter how much you are active on your feet? 'Reversing Achilles Tendonitis', the program, is here for you if you are in pain. No big stack of free bonuses that you don't really need or want. No time limits. Your ebook will still be here available for you later when you've tried everything else. You can't beat the content, you can't beat the price, and there's no risk. If you don't like the program for any reason, I'll refund your purchase. 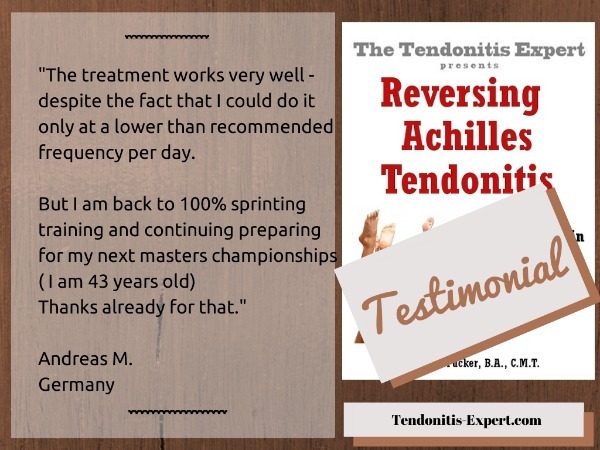 Get your 'Reversing Achilles Tendonitis' program right now and start making your Achilles Tendon and connecting structures healthy again.